OWN tackles polarizing political perspectives other larger networks often avoid. 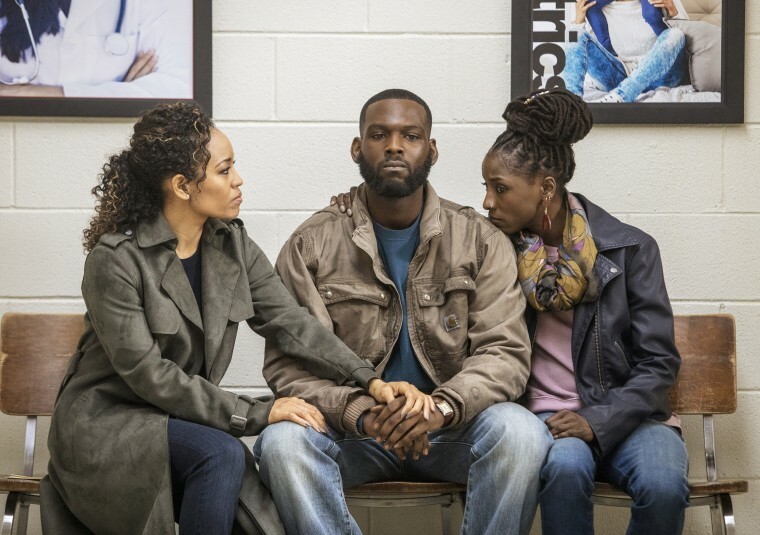 Charley (Dawn-Lyen Gardner), Ralph Angel (Kofi Siriboe) and Nova (Rutina Wesley) in "Queen Sugar" on OWN.Skip Bolen / Warner Bros. Entertainment Inc. In May, "Queen Sugar,” the highly regarded drama produced by the Oprah Winfrey Network (OWN), began its third season with an episode tackling the national anthem kneeling controversy. Coincidentally, the season premiere of the series — which focuses on a black Louisiana family and their farm — ran the same night ABC cancelled its “Roseanne” reboot due to a racist tweet from star Roseanne Barr. OWN’s willingness to support a show like “Queen Sugar” as it confronts such polarizing issues as national anthem protests and police brutality — from a black perspective — is atypical. The same appears not to be true at OWN. Last year’s fourth most-watched cable network among African Americans (behind MSNBC, VH1 and ESPN), OWN doesn’t seem to feel similar concerns or restraints. On Twitter, Ava DuVernay, the activist filmmaker who created “Queen Sugar” from Natalie Baszile’s 2014 novel, acknowledged as much on Twitter. OWN’s niche status feeds its willingness and ability to tackle such storylines. Despite the megawatt stardom of its namesake and CEO, OWN is a relatively small network with a potential reach of roughly 80 million households; In contrast ABC can be found in almost all of the nation’s nearly 120 million Nielsen-estimated TV households. So the “Roseanne” reboot premiere of 18 million viewers drew nearly 25 percent of OWN’s total potential audience. Of course, being a smaller network also has its disadvantages. That lack of broad appeal contains and confines the conversation, which is probably why most mainstream outlets haven’t appeared as interested in the “Queen Sugar” national anthem storyline despite continued headlines on the issue. But there's something else happening here. “Queen Sugar” handles the conversation differently than most shows. A political issue like police brutality does not dominate the plot; rather it is treated as one element of a complicated depiction of African American life. Neither do showrunners provide easy fixes. As season three has progressed, references to the kneeling haven’t disappeared, even as the show moves on to other things. The same is true of a police brutality storyline from season two, in which a police officer pulled over the show’s teenage male star, mistreating and jailing him. That arrest and its consequences resurfaces in season three as well. This makes sense, because unchecked police brutality and other examples of racial injustice cannot be easily resolved in a two-episode arc (or even an entire season). “Queen Sugar” understands that someone like former NFL quarterback Colin Kaepernick is symbolic of broader, systemic problems that don’t go away once the TV cameras do. "I have lots of things that have to do with race,” she continued, “but there are also some things that have to do with culture, with class, with gender identity, with how black folks deal with, handle and reconcile their association with other people of color." Ralph Angel in "Queen Sugar" on OWN.Skip Bolen / Warner Bros. Entertainment Inc. In other words, black people still have to live their lives, be it by doing right by themselves and their kids or simply by trying to maintain or advance in their jobs and careers. It’s a narrative network TV has been slow to embrace. Also “black” cast dramas are extremely rare on most networks. While there is an overabundance of comedy in general on television, black comedic casts overwhelmingly outpace black-majority dramas. Perhaps that’s due to dramas like “Queen Sugar” getting too real. And because ABC has a lot more money at stake — and a lot of more critics to answer to — it simply doesn’t have the freedom to be as open and honest as OWN can be in many of its story choices. That doesn’t mean the entertainment industry shouldn’t aim higher. It just means that, unfortunately, change typically starts out small. Today the “Queen Sugar” approach just doesn’t fit a mainstream network like ABC, even with a black woman at the helm. A decade from now, hopefully that will not be the case and all shows can feel as at home on a network like ABC as “Roseanne” (once) did. Ronda Racha Penrice is a freelance writer and cultural critic. Her work has appeared on The Root, NBC BLK and the Atlanta Journal-Constitution.